Dachshunds are small, lively dogs that are keen hunters. They have an excellent sense of smell; they were bred initially to hunt both above and below ground by burrowing for gophers and rodents. Dachshunds are bred as short-haired, long-haired or wire-haired, and all are known for their short legs and long body. As with all dogs, a dachshund's feet must be carefully monitored to ensure good health and proper grooming. A dachshund's feet are different from those of other breeds. The front paws are tight and compact with arched toes. The paw pads are thick and tough, rugged from their ancestral hunting days. The paws have five toes, four of which are used and one of which is the dewclaw (vestigial claw), which may be removed on the front feet. The hind paws are smaller than the front paws, and also feature rugged paw pads. Dachshunds as a breed are known for various health problems including spinal issues and obesity. Dachshunds' feet, however, are particularly prone to problems. The most common foot problem for dachshunds is dry, cracked paw pads. Although these dogs have very rugged paw pads, hot pavement and age can cause dachshunds to develop painful cracks. Obesity can make already-painful paw pads even more painful, so it is extremely important to maintain a healthy weight for this breed. Dry paws can be treated with moisturizer, which is specially formulated for dogs and can be purchased at pet stores. Dachshunds sometimes can be observed chewing or licking their paws obsessively. This is usually caused by an allergy, though generally assumed to be grooming behavior. Allergens that may cause this behavior include fleas, bacteria, food and even hay fever of the type typically found in humans. The dachshund's veterinarian can run several different types of tests to narrow down the cause of the allergic reaction. 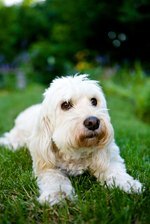 Identifying the cause of the allergy is the key to treating it; if the dog is allergic to its food, it is fairly simple to change dog food. However, if the dog is allergic to bacteria or fleas, treatment may be more difficult. Antihistamines are typically prescribed to treat the itching that causes the chewing and licking behavior. Steroids like prednisone are sometimes needed to control the dog's allergy if it is severe. They are often used on a short-term basis due to side effects from long-term use of steroids. Other foot problems commonly found in the dachshund breed include problem toenails and interdigital cysts (cysts found just under and between the paw pads). Problem toenails can result from lack of grooming and allowing toenails to become too long, which can cause them to rip or tear. You should regularly consult your pet's groomer or vet for toenail maintenance and care. A vet can easily remove interdigital cysts by using a needle to aspirate them. You should not attempt to do this for your dog.